Drug testing employees can be an HR minefield if the company’s drug and alcohol policy is not properly followed, as one business discovered. Forest products company Carter Holt Harvey has been ordered to pay compensation to workers after what the Employment Relations Authority described as a “wrongheaded” decision to drug test staff. The New Zealand Herald reported that the company tested 190 employees last May after cannabis plants were found on company property near Nelson. The site manager said that all employees should be subjected to a “reasonable cause” drug test because the site where the plants were found was only accessed by staff and would be difficult for members of the public to get to, the Herald reported. The Engineering, Printing and Manufacturing Union alerted the company to the fact that it was breaching its own policy and operating procedure. Of those tested, 76 union members took the matter to the ERA and will be paid compensation, although the final figure will be set through mediation between the union and the company. The workers reportedly asked for $2,500 each. EPMU spokesman Alan Clarence told the Herald that making the workers do urine tests would not have revealed the owner of the marijuana plants and that the company had used its position of power to force the tests on the whole workforce. The ERA found that employees had been unjustifiably disadvantaged and Carter Holt Harvey had breached its duty of good faith by forcing them to undergo drug testing. Authority member Christine Hickey described the company’s approach as “wrongheaded” but that the site manager acted with openness and honesty. The company continued with the drug tests, even though it knew it was acting against its own policy, she said. According to the Department of Labour website, there is no specific employment-related law that deals with workplace drug testing. It suggests that employers who suspect workers of drug use should try talking about the issue as the first step. 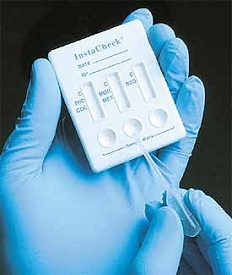 Have you ever had to administer workplace drug testing?